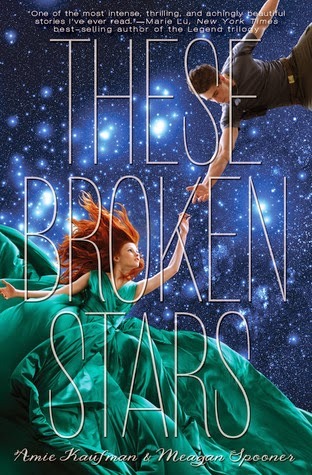 I'd heard great things about These Broken Stars but even though I had high hopes for the story I had no idea how much I would actually love it. As it turns out I was completely hooked from pretty much the first page and nothing could have got in the way and made me stop reading it! I was captured by Amie Kaufman and Meagan Spooner's writing style, I wanted to dive into the world they have created and I fell head over heels for the main characters. This is the kind of book you want to live in, one you'd happily wipe from your memory banks just so you could experience reading it for the first time all over again and I can't wait to carry on reading the series. Lilac is the daughter of the wealthiest man in the galaxy, she has lived a pampered life and been handed everything she could ever wish for. She is surrounded by people who adore her but she knows that most of them are only there because of her wealth and status so although she looks like she's living the dream she's actually rather lonely. As much as she loves her father she feels suffocated by him and she knows all too well what he will do in the name of protecting her and keeping her safe. Tarver is pretty much her opposite, born to a lower class family he is a soldier who has worked hard for everything he's ever had. As a war hero he now finds himself surrounded by the galaxy's elite travelling on the Icarus but he knows he is there more as an oddity to entertain them than because anyone really has any respect for him and he'd much rather be on the lower decks with his fellow soldiers. Lilac and Tarver aren't from the same social circles and there is no real reason for their paths to cross but fate throws them together when their ship crash lands on an unknown planet. Alone and in hostile conditions they are forced to work together to survive while they wait for rescue. I don't want to say too much about what happens when they are on the planet but I loved every minute of it, they are fighting for survival while trying to figure out how the Icarus could crash the way it did but for every answer they find they end up with even more questions. Nothing makes sense and there is an even deeper mystery concerning the planet that they now find themselves stranded on. I think what I loved most about this book was the character development and the utterly delightful romance between Lilac and Tarver. I loved seeing their feelings slowly start to grow as they went from disdain for each other through reluctant respect and eventually into friendship and love. Lilac can come across as quite cold and standoffish towards Tarver in the beginning which makes it really hard for him to get to know her but because we get to see things from both of their points of view readers can understand that she's doing it to protect him from her father. I liked the fact that even though she has been spoiled her whole life she isn't completely useless, she has some skills and even manages to save Tarver's life on more than one occasion. She never complains but instead grits her teeth and gets on with things. Tarver is much more experienced in survival matters but he doesn't pamper Lilac, he expects her to pull her weight but at the same time is happy to teach her what she needs to know. The two of them work really well together and I enjoyed spending time with them both. These Broken Stars kept me on the edge of my seat, there was one particularly shocking twist that left me trying to pick my jaw off the floor and I'm still shocked by the way things played out but I love it when author's manage to pull on my heartstrings and that's exactly what happened here. I know it's only February but would be very surprised if this book isn't in my top 10 reads of 2015 and I absolutely can't wait to make a start on This Shattered World! If you love stories with rich world building and fantastic characters then you need to pick up this series today.